“Belt and Road reflects Beijing’s vision of its role as a great power atop a China-centric regional order – one free of the liberal rules, norms, and values that Beijing rejects as relics of an unfair and obsolete order led by the West,” Nadège Rolland, a senior fellow at the National Bureau of Asian Research, a US-based research institution, wrote in the Foreign Affairs journal this month. Cambodia is Beijing’s strongest proponent of that China-centric order in Southeast Asia. Laos is arguably a close second, and Myanmar is quickly reorienting towards Beijing as Western criticism remounts against its rights abuses. The Philippines, too, is moving in a more overtly pro-China, anti-US direction. Most other Southeast Asian nations have managed to position themselves between the US and China while also keeping Japan and Europe close for hedging purposes. Cambodia understands the need for great power balance, but is increasingly being pushed into China’s orbit due to ramped up Western pressure on its rights and democracy record. But it still needs Western markets to maintain fast economic growth. Since the 1990s, international assistance aimed at restoring Cambodia’s financial health after decades of civil war and mismanagement helped to create an export-driven economy that was heavily reliant on Western trade. Today, more than 60% of Cambodia’s gross domestic product (GDP) derives from exports, with the vast majority coming from garment and footwear shipments. Last year, Cambodia’s exports to all international markets were worth just over $12.1 billion, up 10% from the previous year, and could tip the $13 billion mark at the end of 2019, according to Ministry of Commerce reports released this month. Its two largest export markets last year were the EU and US, representing 29% and 24% respectively of its total shipments. The United Kingdom, which is soon to leave the EU, came in third with a 9% share, followed by Japan at 8%. 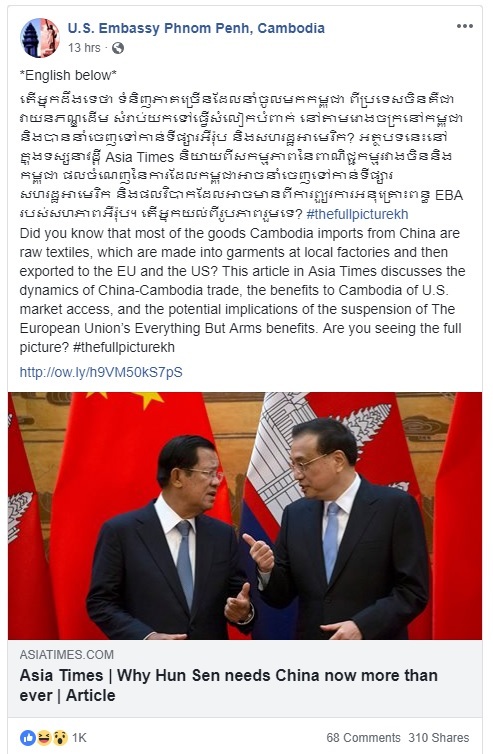 In 2017, China imported a little under $700 million worth of Cambodian goods; the US imported $3.1 billion and the EU $5.7 billion, most of which came under the EBA scheme. Exports to the US rose by about US$700 million last year, the same as China’s total annual imports from Cambodia. When Hun Sen returned last week from China, he announced that Beijing promised to raise bilateral trade to $10 billion by 2023, or nearly double the amount record in 2017. As trade has grown at around 20% annually, that target is feasible on a straight-line projection. It would be readily facilitated if the two countries entered a free trade agreement, which Hun Sen has lobbied for in recent years, though Beijing appears hesitant because it already has a free trade mechanism with the wider 10-member Association of Southeast Asian Nations (ASEAN). That means that most of the goods Cambodia imports from China are raw materials, which are transformed into manufactured garments at local factories and then exported chiefly to the EU and the US. If Cambodia’s exports to the US and EU collapse under new sanctions, there is slim chance that China will come to the rescue considering it has its own low-cost garment sector to keep in business. Still, some optimists think that China could become a major importer of Cambodia’s other goods. Beijing, for example, promised last week to increase the quota of rice it purchases from Cambodia to 400,000 tonnes annually, up 100,000 tons from last year. This would be a boon for Cambodia’s problematic agricultural sector, but China has already failed to live up to past promises to import more of its rice. Last year it raised its quota to 300,000 tons yet only imported 170,154 tons, official statistics show. Rice exports to China actually decreased by 14.8% last year compared to 2017. 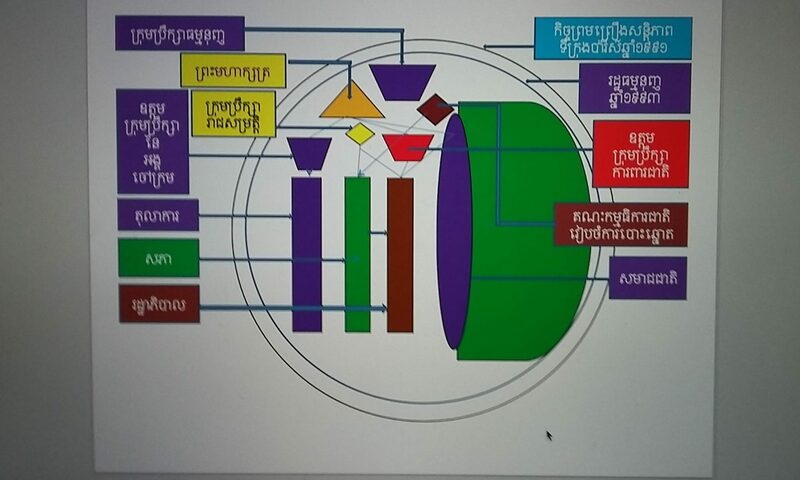 The shortfall has been blamed on logistical problems involving the Cambodia Rice Federation (CRF) and the China National Cereals, Oils and Foodstuffs Corporation (COCFO), the two nations’ respective industry bodies. But this, among other difficulties, will need to be quickly fixed if China is actually to meet the new quota set for this year to double the amount of rice it currently imports. It’s a particularly urgent issue in the Cambodian countryside. Cambodia’s rice exporters are now looking for new markets after the EU – the main purchaser of Cambodian rice which last year bought 40% of the 630,000 tons exported – reintroduced tariffs this month on Cambodia-produced Indica rice, a move to protect European producers. Even if China does manage to meet its new import quota, it is unlikely to boost the sector; any increase in exports to China are likely to only offset decreased exports to Europe. Productivity problems in Cambodia mean that it is unlikely to export more than around 600,000 tons of rice. If Cambodia’s economy falters from new Western sanctions, it’s not clear China will step up enough to subsidize the lost markets and earnings, particularly as its own economy comes under rising stress from its trade war with the US. Latest estimates from the National Bank of Cambodia published this month say Cambodia’s global trade deficit grew by 22% last year to $5.2 billion, meaning it imported $18.8 billion worth of goods but exported only $13.6 billion. Almost 40% of Cambodia’s imports come from China. While Cambodia relies heavily on China for growth and finance, the relationship is a rounding error for China’s massive economy. Nor does Cambodia possess significant energy fields or mineral deposits that China’s import-dependent giants require. But Cambodia is a loyal ally, significantly at a time the US is pressing countries to take sides. It has twice come to Beijing’s aid in recent years by pressing ASEAN to drop aggressive statements on China’s expansionist activities in the South China Sea. It is also a strong proponent of BRI. Whether that loyalty and lobbying will be enough for Beijing to come to the rescue of a potential economic collapse in Cambodia is an important question without a clear answer. Previous PostPrevious Is Cambodia’s Foreign Policy Heading in the Right Direction?